The best knife blocks create a space where you can organize and catalog your finest kitchen knives and tools. They are durable and long-lasting, and easy to clean as well. To help you find the best kitchen knife block set, we researched a variety of new and best selling products. 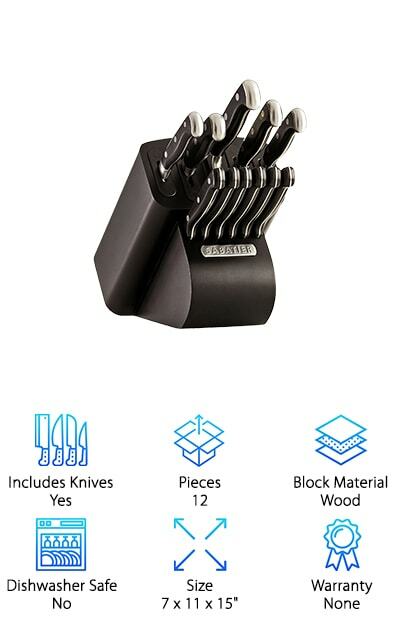 The result is the top 10 knife block set reviews. You will find your best kitchen tools yet. Now: Before we get started, here’s what you need to know when shopping. Includes Knives: You may be in the market for the perfect knife block because you already have the knives at home. We found those for you. We also found block sets that incorporate high-quality knives, just in case you're looking for both. Block Material: The blocks we have selected are all tough, and they are constructed well. Some of our favorites are made from wood, along with specific woods like bamboo. Our top rated knife block sets are solid, and you’ll love their appearances. Dishwasher Safe: We looked at the cleaning methods utilized for both the knife block and the knives themselves if they are included in your purchase. That way, you are briefed on upkeep before they arrive, and you know what to expect. Size: Some of these blocks are a little smaller, and they come in dimensions that are more flexible for keeping on your counter. Others need additional room, so make sure to see how big each item is before you buy! Warranty: It’s a common concern: You want your brand-new knife block to come with a buy-back option, or your money back if something goes wrong with the manufacturing process. We get it! Every warranty is marked down for you here. 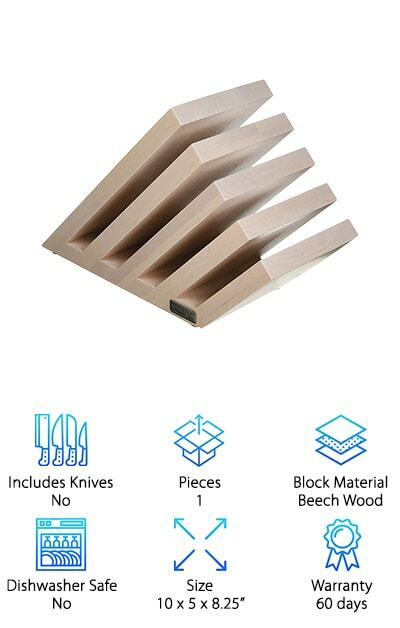 Now that you know how to select a wonderful knife block set, let’s get right to the reviews. Here’s the deal: if you’re in a hurry, take a look at the top pick and the budget pick. Both are fantastic products, and they are among the best knife blocks we found. Right below, you’ll find all runner-ups in our kitchen knife block set reviews. If you’re looking for the best knife blocks for your kitchen, they’re on this list. There are few knives out there that will cut better than Japanese steel knives from Ginsu. That’s why the Ginsu Gourmet Chikara Knife Set is one of the most widely-sought knife sets around. It has been named a Consumer Report “Best Buy” 5 times. The block is a beauty, made from bamboo wood. Despite its creation by a Japanese brand, it is crafted with precision in a little town in Arkansas. It is a rich caramel color that will blend in well in your kitchen. 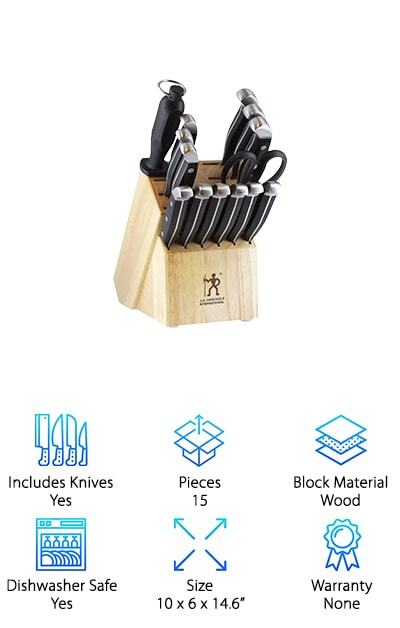 This is a set of 12 pieces, however, and here are the other items you will receive: An 8-inch chef’s knife, a 7-inch Santoku knife, a 5-inch utility knife, a 5-inch serrated utility knife, 4 4.5-inch steak knives, a 3.5-inch paring knife, kitchen shears, and a honing rod. As you can imagine, these knives are extremely sharp. The honing rod allows you to re-sharpen them at home. 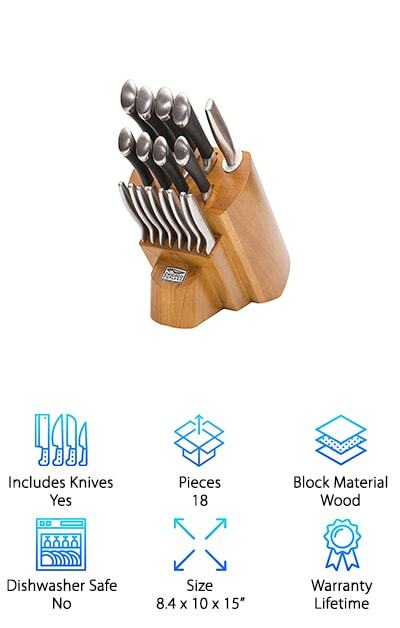 These top rated knife block sets are magnificent! Our budget pick comes from a brand with longevity in the kitchen tool game. 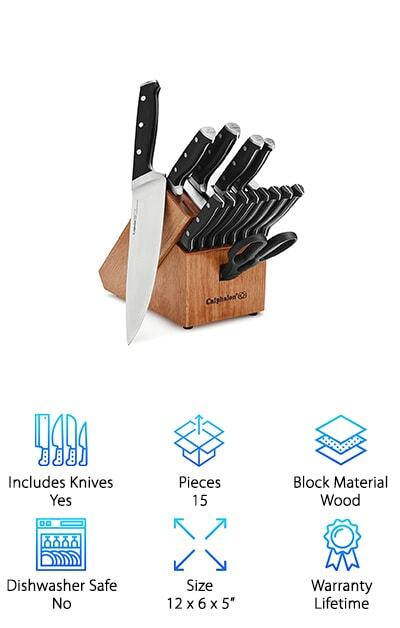 The Cuisinart Knife Block Set hits the top of our list for a lot of reasons. First and foremost is its highly affordable cost. 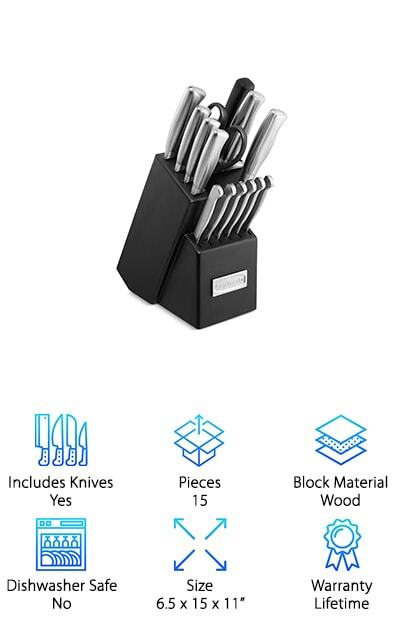 You receive both the excellent knife block and an additional 14 pieces. Here’s what you get: The block itself is made from wood, painted matte black. It is extremely easy to clean and it will match kitchens of any color. Then there are the knives. All are made of stainless steel, so wear and tear will be minimal. You get an 8-inch chef knife, an 8-inch slicing knife, a 7-inch Santoku knife, a 5.5-inch serrated utility knife, a 3.5-inch paring knife, a 3.5-inch bird's beak paring knife, an 8-inch sharpening steel, and a pair of all-purpose household shears. Do you see why this easily wins the “best universal knife block” title for our reviewers? It is the addition your cooking so badly needs. A good knife set should be helpful and not intimidating. The fact is, even the worst cooks can become better if they have the right tools at their disposal. The best knife block set can help you to cook, bake, meal prep, and feed your family faster and with greater ease. You also don’t need to shell out a lot of dough for fine cutlery. Knives are available that will stay sharp, and look good doing it, at a decent price. Take, for example, the Chicago Cutlery Fusion Block. Every one of these blades is forged from high-carbon stainless steel. You’re not going to have to worry about these knives getting rusty before their time, especially if they are cared for well. The handles are black comfort-grip poly, and they will stay put even as you work with wet or greasy food. Other plastic handles can slip a little. The block is a fine stained pine wood piece. Perhaps you’re looking for a fine knife block, along with a good set of knives. You’re hesitant, however, because it sounds like having to sharpen these knives on a regular basis is going to be a lot of work. What if we told you there was a knife block out there with the ability to sharpen your knives for you? Meet the Calphalon Classic Knife Block Set. It contains built-in ceramic sharpeners! It gets better: As tiny bits of the knife are shaved off by the sharpeners, they are collected automatically within the block. Even clean-up is handled for you. How awesome is that? The Calphalon set is beautiful, too. It is 15 pieces total. The block is blonde rubberwood. Every one of the knives is labeled for easy ID within the block. You don’t have to pull out knife after knife to find the one you seek. There is also a lovely set of shears for cutting. 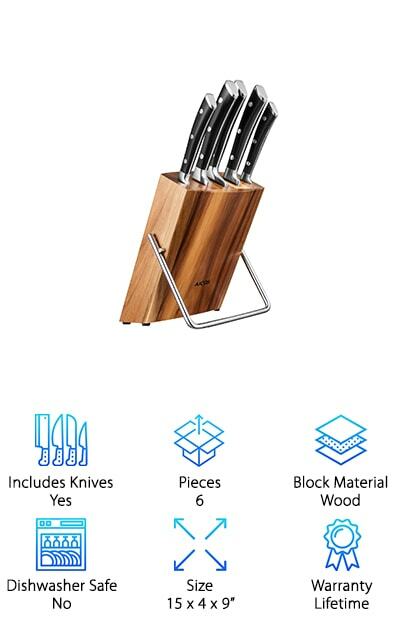 Here is one way to easily identify the knife you need: Acquire a see-through knife block! 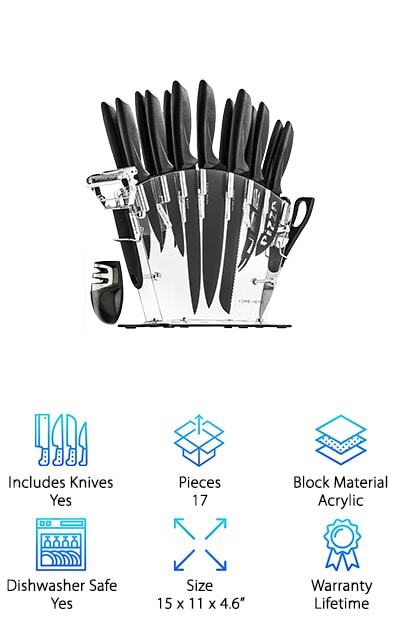 That’s right: The Home Hero Knife Set with Block is made from acrylic, and you can easily see every single one of the 13 knives you get with purchase. There is a bread knife, a carving knife, a chef's knife, a utility knife, a paring knife, a pizza knife, a cheese knife, and a set of steak knives. Everything that you need is here. This is so much more than a knife set, however. There is also a peeler, scissors, and a sharpener. The sharpener has two modes. The V-grip bottom holds it in place as you work, and precision angle guides your hands. Left-handed people can use the sharpener as easily as right-handed cooks! The acrylic stand contains an inner structure to hold every device without risking damage. These knives are safe for top-level dishwasher use and should be dried immediately after the wash. When you buy the J.A. Henckels Knife Set, you are investing in no-nonsense functionality. These knives work, and they work well, without pretense. This is a 15-piece set, with 14 accessories tucked snugly into a slotted hardwood block. Like the rest of our top knife block sets, the J.A. Henckels set is balanced finely between the blade and handle. The blades are full-tang, which means that the sharpened edge extends to where the handle begins. They are all stainless steel with a satin finish. The handles are triple-rivet with a stainless-steel end cap. When you hold these knives, you will find you have to make very little effort to point the blade in the right direction and apply pressure as needed. 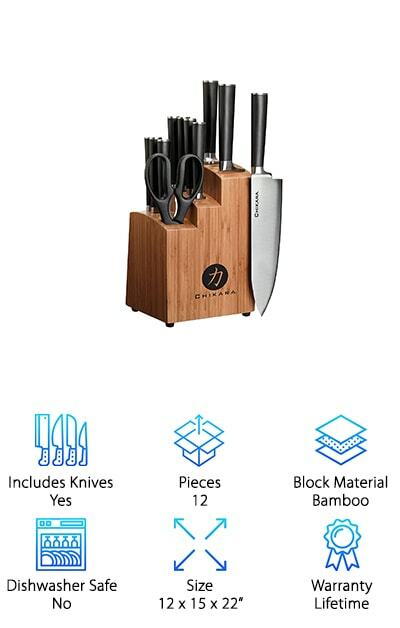 Here's the deal: You will get a paring knife, two Santoku knives, a serrated utility knife, a bread knife, a chef's knife, 6 steak knives, kitchen shears, and a sharpening steel. Every item is dishwasher safe. It's time to get cooking! You want good knives, and their history of excellence in manufacturing and construction matters to you. We totally get that. That’s why our reviewers had to include the Aicok Knife Block Set. Here’s the scoop: These knives are designed and made in Germany, from high-carbon stainless steel. 5 of them are set into a knife block made from Acacia wood. There may be just 5 knives, but they are everything you need to turn into a real kitchen whiz. There is an 8-inch chef’s knife, an 8-inch bread knife, an 8-inch carving knife, a 5-inch utility knife, and a 3.5-inch paring knife. They hold their fine, sharp edge extremely well. They are full tang, so the blade runs from knife tip to knife handle, and they are also rust resistant. A good knife set and the accompanying block are an investment you make in your home. This is a good one. In fact, Aicok offers a lifetime warranty on this kit. A sharp knife is a safe knife. That is the philosophy behind the Sabatier company and their Pro Knife Block Set. This is a 12-piece work of art. 11 knives are placed into a wooden block, which is painted matte black. It is easy to wipe down and keep clean when it gets cruddy. Then, the knives begin with high-carbon stainless steel. This metal is resistant to rust and to corrosion. You get an 8-inch chef knife, an 8-inch slicer, a 5-inch chef’s knife, a 4.5-inch fine-edge utility knife, a 3.5-inch paring knife, and 6 steak knives. Every single knife has its own slot on the block, and built into each slot is an automatic sharpener. Integrated ceramic rods reset the edge so that you never deal with dullness. The handles are steady, traditionally triple-riveted in black. Each knife should be hand-washed and dried immediately. The dimensions of the entire product are 7 by 11 by 15 inches. It might surprise you to learn that some knife blocks are true works of art. The Artelegno magnetic knife block falls into that category. It is crafted by artisans in Italy and shipped all over the world. Each block is made from solid beech wood. Then, it is inlaid with powerful magnets to hold your knives in place. Artelegno’s designers created blocks in several sizes, but we like the one created for 14-knife sets. There are 5 magnetic partitions. Each one holds knife blades up to 11.6 inches long. The wood is treated to be resistant to stains from food. It is finished with lacquer so that it holds its shine and the color of the material is protected. It is fade and mildew resistant. Only renewable wood resources are used here, so you can rest assured that your Artelegno block is eco-friendly. This makes a fabulous gift for a chef or someone who has just purchased a new home. Are you a stickler for organization? Do you look at your beautiful knives, stuck in a crowded drawer somewhere, and sigh? 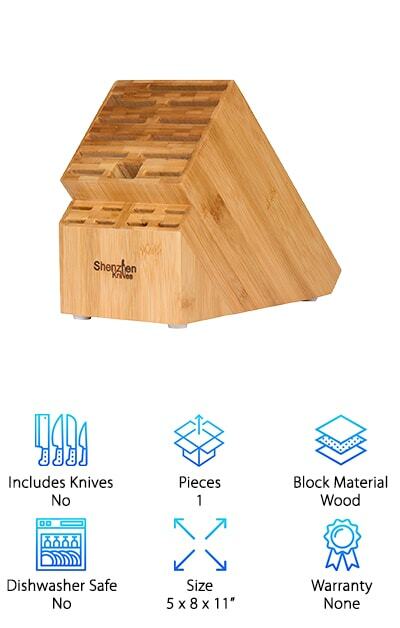 Give those beauties a new place to call home with the Shenzen Universal Knife block. This Japanese knife block truly is universal – because it has 20 slots! That’s right: 20 slots, placed into a bamboo and wood-core block. The slots are spread out across 8 levels, and they are all different sizes. Everything from steak knives to cleavers will fit here! The dimensions of the block itself are 5.25 by 11 by 8.25 inches. It is not huge – it will not take up all your counter space. It takes up just enough room for an appealing knife display, saving you cupboard space in the process. The angled edges will ensure your knives don’t get worn out while they wait to be used. There are non-skid rubber feet on the bottom to protect your countertop or your island.